Grafenberg, 01/29/2014. The record number of visitors and exhibitors at the Elecrama 2014 trade fair in Bangalore could be a sign that growth in India is picking up pace again after its patchy performance in recent years. RAMPF Dosiertechnik and RAMPF Giessharze are certainly very satisfied with the response to their technologies and system solutions for reliable sealing, casting, and adhesive systems at the trade fair. For many of the industrialized nations right now, a growth rate of five percent is more a reminder of the good old days than a realistic target. For India’s economy, though, this might just signal a return to even higher growth rates. The potential certainly exists. Around 1.2 billion people, many of them young and well-qualified, generate strong domestic demand, and the national parliamentary elections scheduled for May this year could “prompt further reforms to the economic system and boost the infrastructure investment that is so desperately needed,” believes Hartmut Storz, Sales and Marketing Director at RAMPF Dosiertechnik. There was a tangible sense of optimism at this year’s Elecrama trade fair. According to the organizers, more visitors and exhibitors than ever before attended the Bangalore International Exhibition Centre from January 8 to 12, 2014, where they were keen to learn all about the latest developments in the field of electrical communication and distribution systems. 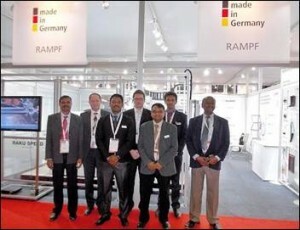 The RAMPF Group was represented there by the companies RAMPF Dosiertechnik and RAMPF Giessharze. 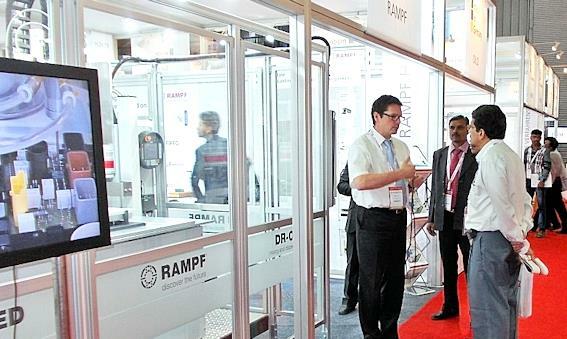 Visitors to the combined RAMPF stand got the chance to watch the DR-CNC dispensing robot processing the fast-curing soft integral foam RAKU-PUR® Speed. “This was our way of offering visitors to the trade fair an insight into our technical innovations while also demonstrating how they can cover a large proportion of their production process with a single manufacturer,” says Hartmut Storz. Visitors to the fair were also interested in the diverse portfolio of polyurethane, epoxy, and silicone casting resins and the associated application technologies for the reliable processing of electric and electronic components. RAMPF Giessharze offers a wide range of products and customized solutions for insulating, protecting, and embedding sensitive components. 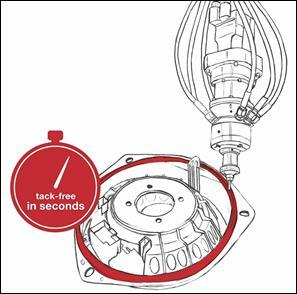 The casting systems for electrical and electronic applications with UL94 and RTI certification undergo extensive quality tests and satisfy all the criteria of the automotive and electronics industries. The innovative systems from RAMPF Dosiertechnik for processing single, dual, and multi-component reaction resin systems also ensure the electronics industry benefits from maximum process reliability when it comes to applying highly-filled heat dissipation materials to electronic assemblies.